Argentina offers a fantastic introduction to South America. I was reminiscing about our trip from a few years back (our first and only foray to date into Latin America) and thought I'd share my Top 10 (+1=11) things to do in and around Buenos Aires. 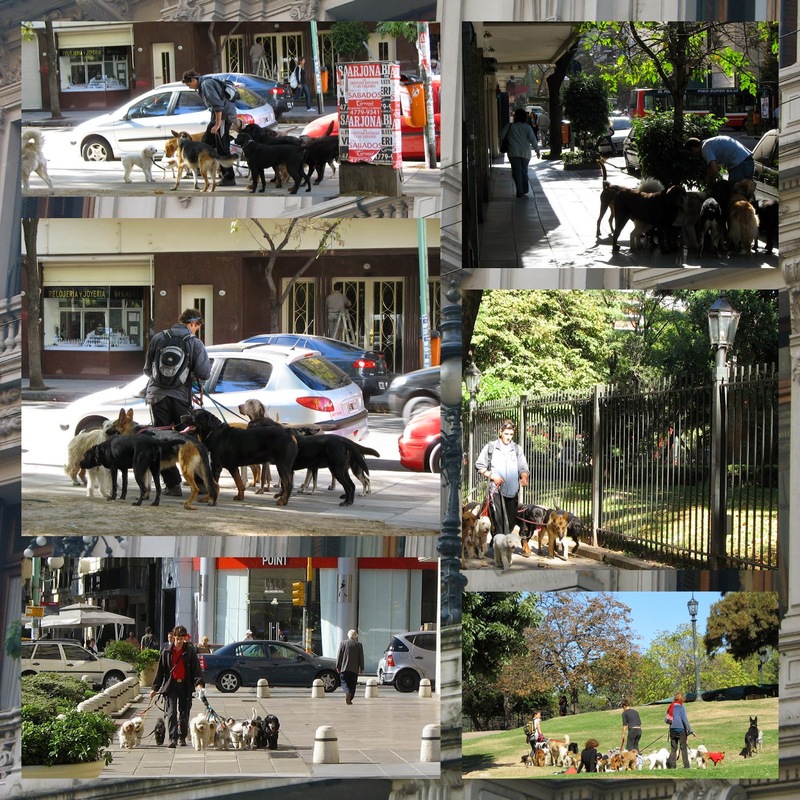 The first thing that struck me as we were walking around and getting acquainted with Buenos Aires was the dog walkers. This seems like big business in Argentina as they are everywhere. Every so often, we'd encounter someone with a handful of leashes and a motley crew of pooches in tow coming towards us on the street. The sight of the dog walkers always made me smile. Argentina is known for its passion and that is certainly played out in the national dance, The Tango. You can take lessons but I have two left feet so settled for dinner and a tango show at El Querandí. Leather is a hot commodity in Argentina. 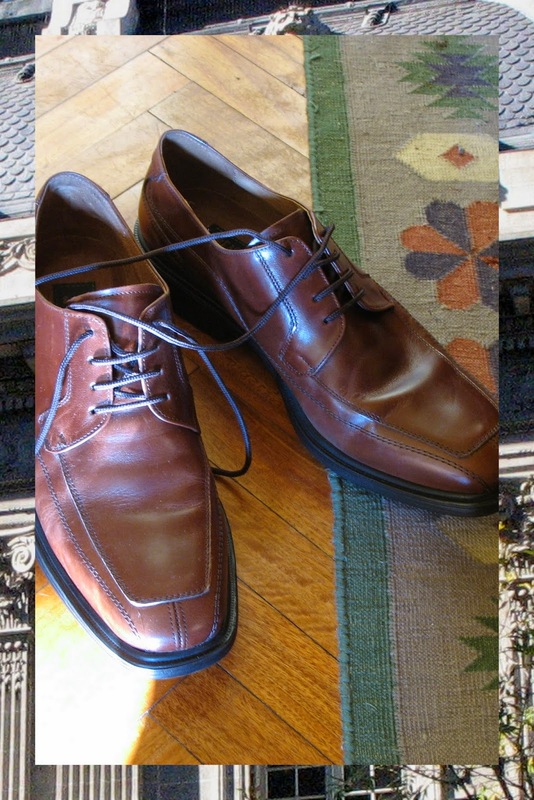 We found great deals on leather shoes and leather jackets (not pictured). On our last day in Buenos Aires, we had leather jackets custom tailored for us in just a couple of hours. Whenever I wear it (less often now that we live in Dublin because of the constant threat of rain!) I think of this trip. Food memories are often the strongest for us. We loved sitting in a cafe and scrutinizing a Spanish language newspaper to see if we could get the gist of the news with our rudimentary grasp of Spanish. 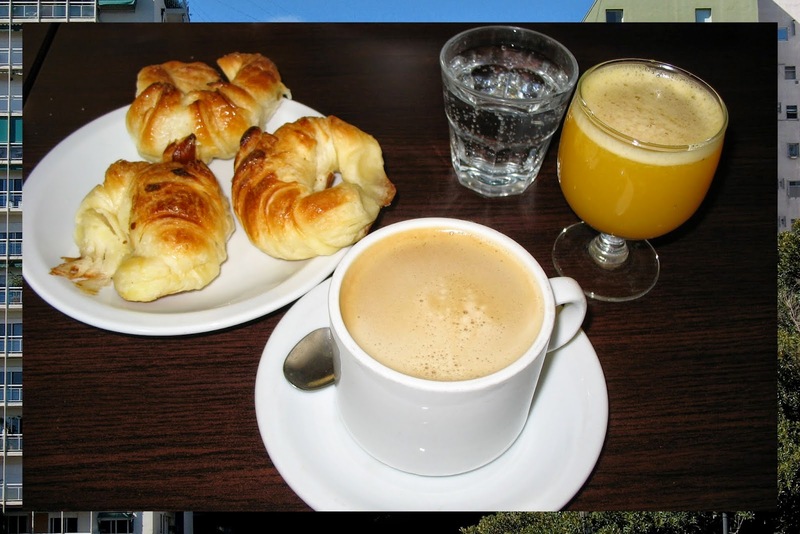 Cafe y Tres Media Lunas (3 half-moon croissants) was our most popular breakfast indulgence. 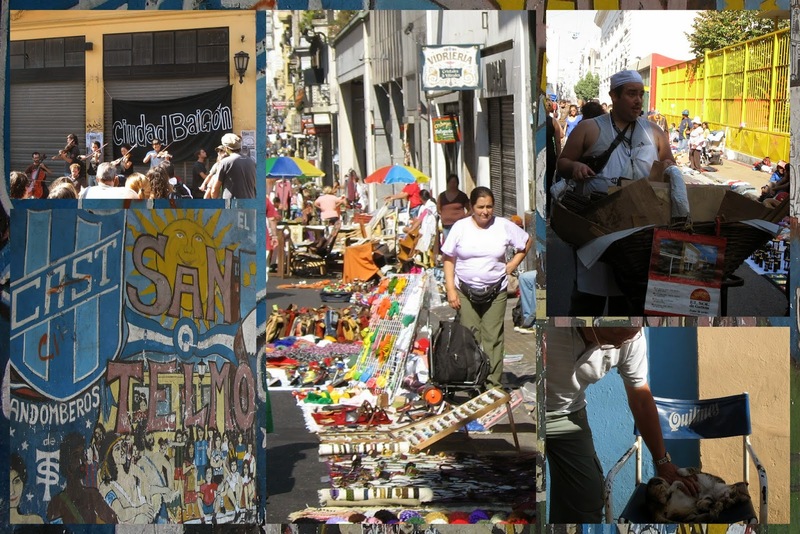 We took the subway to the San Telmo street market and spent the afternoon happily shopping away. This part of the city has a great vibe and is fun for people watching (not to mention the delicious churro vendors). 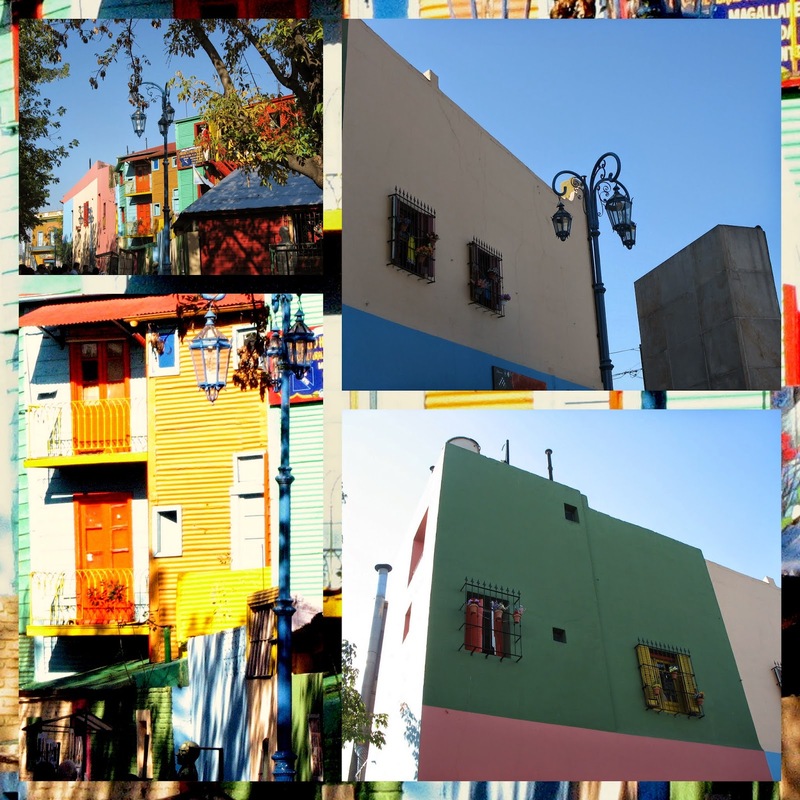 In Barrio La Boca, La Caminito is a bit like Fisherman's Wharf in San Francisco (it's where all the tourists go). Still, it was worth stopping by to steep in the colorful atmosphere. Vegetarians beware...Argentina is in love with steak. Parrilladas (open BBQ pits) grill them up thick and juicy. 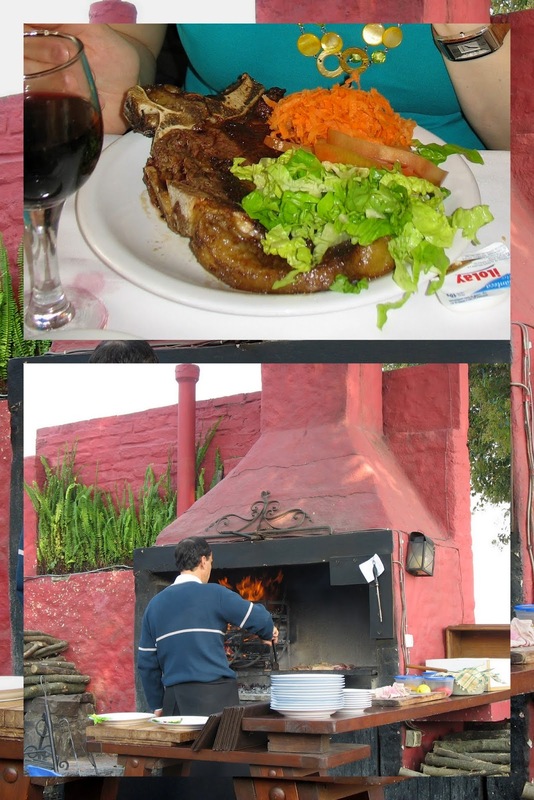 We really enjoyed dining al fresco and pairing our steak with either an Argentinian Malbec or Uruguayan Tannat. Take a step into the world of Eva Perón, the beloved first lady of Argentina who was made famous the world over in the musical Evita. 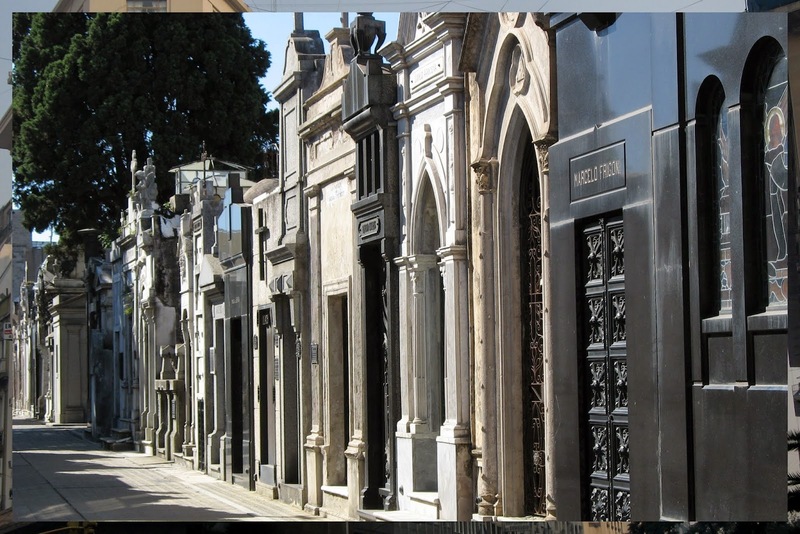 It's popular for tourists to visit her grave in the posh La Recoleta neighborhood. I don't know why, but I've always been fascinated by Uruguay. 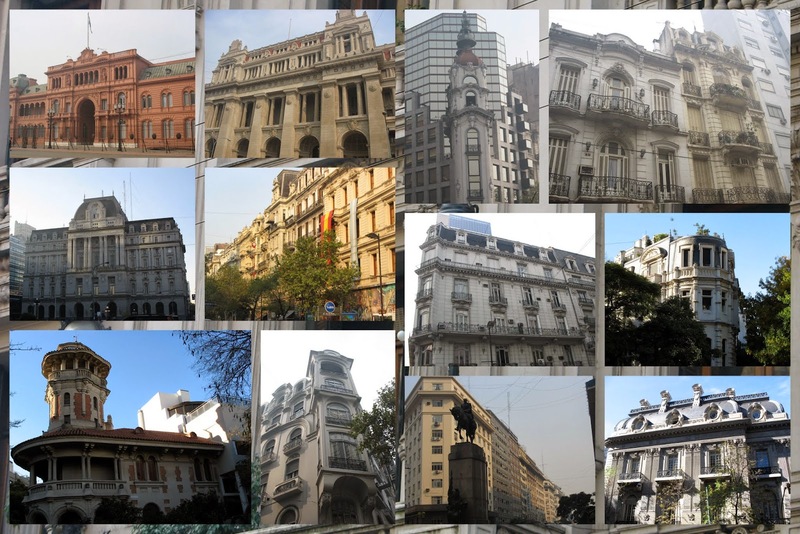 Buenos Aires turned out to be an ideal home base to pop over. We visited Colonia and spent a night in Montevideo. Uruguay definitely had a 'lost in time' feel. We noticed a regular stream of horse drawn carriages that were making deliveries or picking up trash and recycling. It was a surprising anachronism in this modern city. If you're staying in Buenos Aires, there is no excuse not to add Uruguay to your itinerary. I grew up near Niagara Falls, arguably one of the natural wonders of the world. 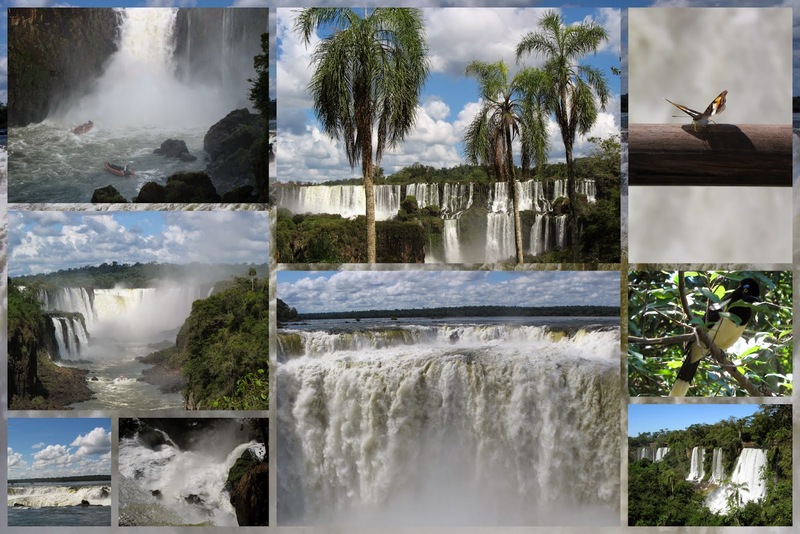 When I saw Iguazu Falls in its lush rainforest setting, all I could think was 'Wow'! We took the short train ride through the jungle to La Garganta del Diablo (Devil's Throat). The sheer volume of water and raw power tumbling over the cliff was a site to behold. We finished our day at the Falls with La Gran Adventura. We found ourselves at river's edge after a 6 km ride in an all terrain vehicle through the jungle. We donned life vests, secured our belongings in thick plastic bags, and embarked on a speed boat ride to the Falls. This cruise makes the "Maid of the Mist" at Niagara Falls look incredibly tame in comparison. The boat actually appears to go into the Falls at one point. To say we got showered is an understatement. The ride was thrilling, fun, and a great way to cool off after a hot afternoon of hiking. We were particularly impressed by the dedication of the videographer who came along on the tour. He stood on the bow of the boat with his camcorder wrapped in a plastic bag. We thought for certain that he'd fall into the water when we plunged into the Falls -- he was hanging on with only one hand since he was working the camera! Amazingly, he made it through safely. 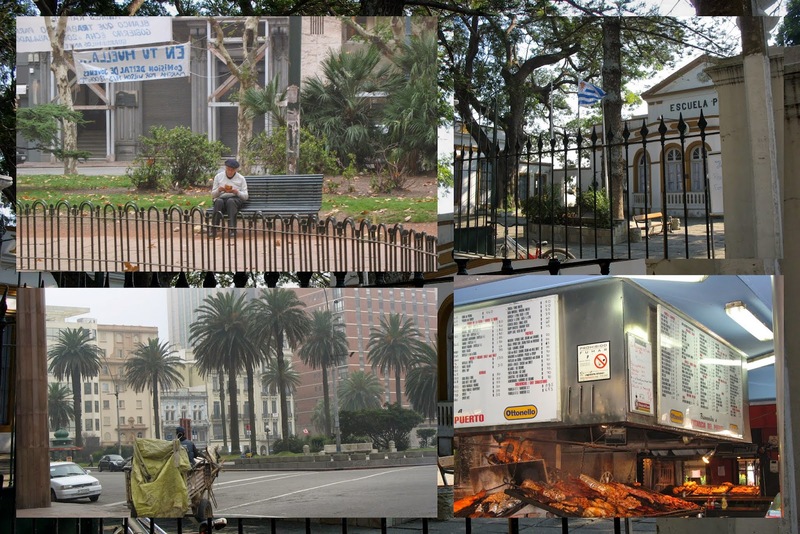 I think Buenos Aires is a great introduction to South America because it is somehow so familiar. If you parachuted in blindfolded, you might just as well think you were in Paris thanks to the ornate Art Nouveau'ish architecture. Buenos Aires is ideal if you're looking for an inexpensive European-style trip. Overall, we had a fantastic time on our introductory trip to Argentina. We feel like we only just scratched the surface of Buenos Aires and the surrounding area (you can dig deeper with this ultimate guide to Buenos Aires or this Buenos Aires travel guide). We can't wait to visit again soon. 10 cool things to do on a trip to Buenos Aires, Argentina. A blog post written by travel blogger, Jennifer (aka Dr. J) from Sidewalk Safari.